The king behaves just as any normal piece and can be captured. There is no check, no checkmate, and the king being under attack is not an issue if you want to castle. If you can capture a piece, you have to capture it. If you can capture several pieces, you can choose to take whichever of them. 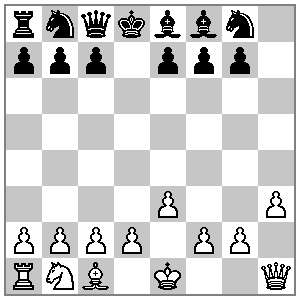 You win if and only if you are stalemated, i.e. either when your opponent has taken all your pieces or when none of your remaining pieces can move. My friends Fabi and Mag love chess, but just for fun they also like to play a casual loser chess game once in a while. Indeed, when I met them yesterday evening they were in the middle of a fascinating loser chess game. Fabi, who was playing White, told me that he had just played his 15th move. How did they reach this position? As Parseltongue explained in his answer, a good question to start with is: what black piece has taken the white rook ? We need 6 captures to reach this position. At least 4 of them are actually consecutive. The answer is unique, and even the move order is unique. The most active king has played exactly 3 more moves than the other king. This puzzle is an entry in Fortnightly Topic Challenge #40: Retrograde Analysis. POST-MORTEM: Absolutely relieved to say that, after a week of this puzzle keeping me up at night, the solution was finally found in a multi-day collaboration with @instantsoup. InstantSoup found all the key insights all at once! Can't wait for the next puzzle! The really insane thing about this puzzle, is that it was possible to get a 17, 18, 19, 20, and 21-move solution, each of which shared very few moves in common with the actual solution. I'll keep working on this throughout the week. It's really, really difficult. 1. e3 Nh6 2. Nf3 d5 3. Be2 Bd7 4. O-O Bc6 5. h3 Rg8 6. Kh2 Kd7 7. Ne1 Ke6 8. Na3 Qc8 9. Bd3 Bb5 10. Bxh7 Bxf1 11. Bxg8 Nxg8 12. Nb5 Bxb5 13. EDIT 4: 19 moves. Introduction of completely new idea: the rook must be captured on h2! EDIT 6: 18 move solution with a completely new idea... this has to be the breakthrough. Rook must be captured by the pawn on h2! The Black bishop cannot move, and therefore cannot have taken the white Rook. This means that the white rook had to have been captured on f1 (likely by the white bishop) or h2. Parseltongue and InstantSoup joint efforts solved the problem. It is the only solution, and the move order is unique as well. As a remark, a slightly better version of the problem is the one I published in 2006: put the bK on c8 and the bQ on d8, and search for a proof game in 15.0 moves, i.e. find the game that arrived in this position after Black's 15th move. Not the answer you're looking for? Browse other questions tagged chess retrograde-analysis or ask your own question. One-sided chess: Can you stalemate yourself?